University President Lawrence S. Bacow, pictured in May 2018. University President Lawrence S. Bacow discussed the challenges higher education institutions face and defended Harvard’s leading role among colleges and universities at an American Enterprise Institute and Brookings Institution panel Thursday. The panel — which included education policy experts from Georgetown University, the Urban Institute, and Strada Education Network — focused on the future of higher education and the issues the industry faces in contemporary times. 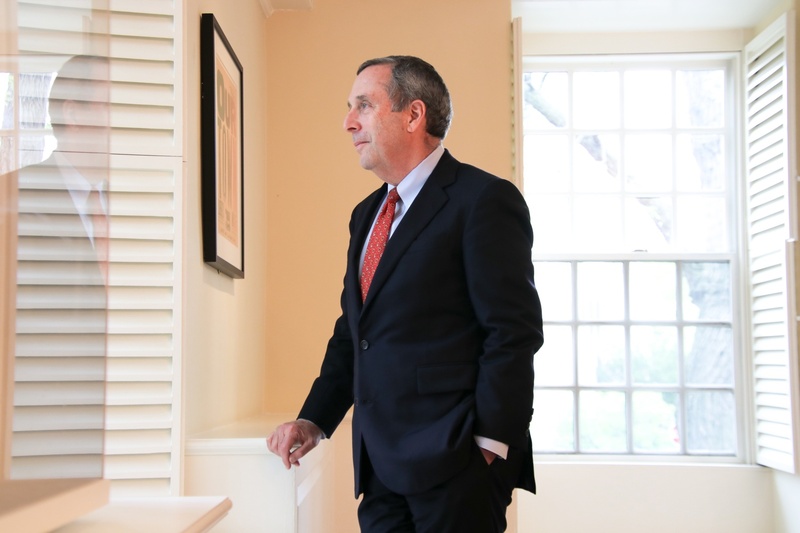 Bacow discussed a number problems Harvard itself is facing, among them accusations of elitism and political bias as universities across the country are facing a hostile political climate. Defending the University against these sentiments is nothing new for Bacow — he has spent months traveling across the country to cities like San Diego, Calif. and his hometown of Pontiac, Mich. to make the case for Harvard to people in all parts of the country. “We are perceived as being elite institutions at a time in which the word ‘elite’ has become a bad word when applied to anything but a quarterback,” Bacow said. Bacow also noted that a “challenge” for institutions like Harvard is that they are seen as self-serving, rather than focused on public service. Since taking office, Bacow has publicly pledged his support for public service internships — which are often low-paying or unpaid summer positions — for every undergraduate who would like to pursue a position in that sector. Though Bacow underscored the importance of engaging with and responding to criticisms against Harvard and other universities, he also defended the role research universities play in the world. “It’s the ability to aggregate and concentrate and create human capital that determines the wealth of nations and regions, and what the great research universities do is exactly that,” Bacow said. Brain drain is the phenomenon of students from around the world coming to study at universities like Harvard and deciding to remain after graduation, rather than returning home with their degrees. During the roughly one hour and fifteen minute panel, Bacow touched upon a number of Harvard-specific issues that he has had to face down during his first year as University President. He focused on a new $40 million to $50 million tax on Harvard’s endowment and an ongoing anti-affirmative action lawsuit alleging Harvard discriminates against Asian-American applicants in its College admissions processes. When a discussion about admissions surfaced, Bacow brought up the lawsuit and defended the University’s position. “We’ve spent millions of dollars defending against the lawsuit, that I think many of you are aware of, in which we’ve made the case that… we are all more than just our numbers, that it shouldn’t be reduced to just one’s grades and SAT scores,” Bacow said. During the discussion, moderator Richard V. Reeves of the Brookings Institution pressed Bacow on a number of points, including Bacow’s argument that students in the U.S. “can get a great education” and “succeed” after going to almost any institution. “Having an Ivy League degree definitely helps,” Reeves countered. Bacow also talked about the importance of creating broad access to higher education across the country.